The FOXPRO Inferno gives you a lot of "bang for your Buck" with a compact design, 75 high quality FOXPRO sounds, and an upgraded remote control with FoxBang technology. The Inferno weighs in at only 1.5 lbs with batteries. This unit offers maximum portability with extreme volume and sound quality. Connect an external speaker to the jack on the side of the unit for even more volume. 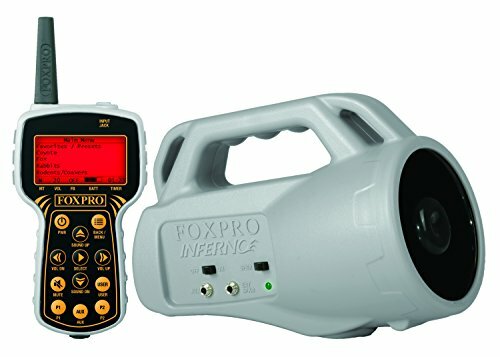 FOXPRO Inferno remote is easy to operate and navigate through sound categories. The Inferno remote has two preset buttons, a mute button, volume up and down, and much more. All of these features in one amazing, compact, high quality unit makes the Inferno an incredible value. It's packed with great features and innovations from FOXPRO. The Inferno is backed by a 3 year limited warranty and FOXPRO unmatched customer support and is proudly made in the USA.